The Philippine Archipelago consists of 7,107 islands with a total land area of 300,000 square kilometers or 115,830.60 square miles (about the same size as Italy). The 11 largest islands contain 94% of the total land area. The largest of these islands is Luzon at about 105,000 km². It is where the capital city of Manila is located. The next largest island is Mindanao at about 94,600 km². The Philippines is approximately 800 km from the Asian mainland and is located between Taiwan and Borneo. The Philippine islands are divided into three groups: Luzon, Visayas, and Mindanao. The Luzon islands include Luzon itself, Mindoro, Palawan, Masbate, and other smaller islands. The Visayas is a group of several small islands, the largest of which are: Panay, Bohol, Negros, Cebu, Leyte, and Samar. 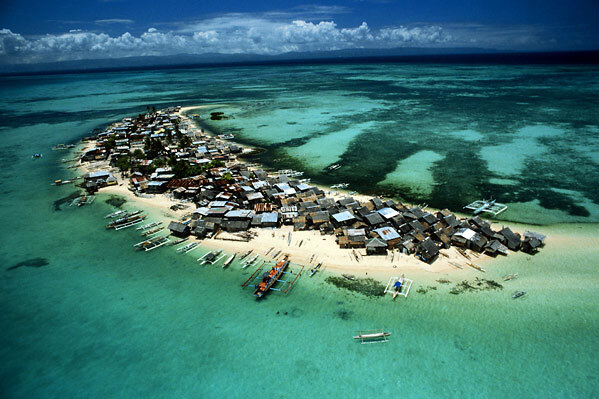 Mindanao island includes Mindanao island itself and the Sulu Archipelago, composed of Tawi-Tawi, Basilan and Sulu. Each island group has a Philippine destination worth visiting. The islands of the Philippine archipelago are volcanic in origin and are mountainous. The islands are part of the Pacific Ring of Fire. Mt. Apo (2,954 meters above sea level) in Mindanao is the highest peak, while the second highest peak is Mt. Pulog in Luzon. It rises 2,842 meters above sea level. The Philippines have numerous rivers, volcanoes, streams, narrow coastal plains and beautiful sandy beaches which foreign and local tourist enjoy. The country has a total of 36,289 kilometers of coastline. Travel within the Philippines not difficult, if you don't mind riding the sometimes rickety public transportation. There are all kinds of transportation available to tourist and locals: Airplanes and ferries for inter-island transfers, buses & taxis ply in major cities all over the Philippines and the ubiquitous jeepney can be found everywhere. In Metro Manila, modern light rail transit is available on main roads. In tertiary roads & small rural towns the tricycle is the transport of choice. The official languages in the Philippines are Filipino and English. Filipino which is based on the Tagalog dialect (the dialect of national capital region), is the national language. English is also widely used and is the medium of instruction in higher education in the Philippines. There are also 76 major local languages and more than 500 different minor dialects throughout the archipelago. 83% of Filipinos are Roman Catholic. The rest are made up of smaller Christian denominations, Moslems and Buddhist. Foreign nationals are allowed to enter and travel within the Philippines for 21 days without a visa provided that they have valid tickets for their return journey to their port of origin or to their next travel destination port and that their passports are valid for a period of at least six (6) months. Extension of stay is available at the Philippine Bureau of Immigration after paying a minimal fee. For stays longer than 21 days, a Temporary Visitors Visa is required. Exceptions: Passport holders of Hong Kong Special Administrative Region (SAR), British National Overseas (BNO) and Macao Special Administrative Region (SAR) passport holders are only allowed up to 7 days stay without a visa. Foreign nationals from Brazil and Israel are allowed up to 59 days without a visa. Foreign nationals from Afghanistan, Bangladesh, India, Iran, Iraq, North Korea and other countries not in the list are required to have a visa even if the stay is less than 7 days. Holders of Brazilian and Israeli passports can enter without a visa and stay for a period not exceeding 59 days.